This still looks like Drummond is seriously considering taking a bite out of Cauty's ear. We may have been loopy, but this caused us to laugh a LOT and consider what foods would have "ear consistency." Please leave your ideas in the comments! What's that you say? You're not particularly into early 90s house/ dance music? You think it's all super lame? Or perhaps you think, "Oh, yeah!! I remember that song '3 AM Eternal.' Junior high school ruled." Let us be the ones to tell you - there is SO much more to this story. 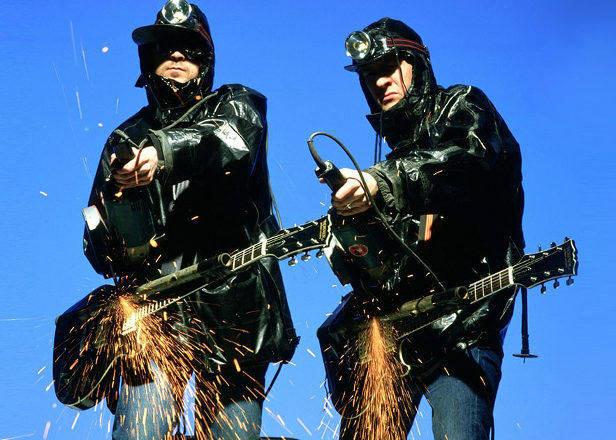 The KLF are known for their popular dance songs "3 AM Eternal," "What Time is Love," and "Justified and Ancient." You may also know them for their novelty pop song done under the band name "The Timelords," called "Doctorin' the Tardis." What you may NOT know is that they gave a big middle finger to the British music industry with an outrageous display at the 1992 Brit awards, deleted their entire music catalog, and burned a million quid. Why, you ask? The answer will take us deep into discordian thought - you may never see the world quite the same way again. We have a lot of reference links and photos for you this time - so please enjoy. Principia Discordia - Website devoted to bringing the Principia to the masses. KLF - the making of Justified & Ancient and America: What time is love? - Ever wonder what it is really like on the set of a music video? It's bizarre.